Here's an interesting piece of information about the new Enriched Air Diver Course, as written by PADI's marketing team. The PADI Enriched Air Diver Course Online incorporates changes to the recently revised PADI Enriched Air Diver program, including a dive-computer only option which simplifies the learning process.How does the online course work?The PADI Enriched Air Diver Course Online follows the same format used in other PADI eLearning SCUBA courses. 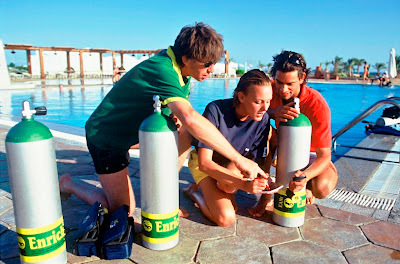 • Divers complete all knowledge development online: This includes an active slide presentation with supporting voiceover, photos, diagrams and links to associated video clips. Divers will also have access to an online version of the PADI Enriched Air Diver manual after completing the course. • As they proceed through the course, divers complete interactive exercises and the knowledge review. The PADI eLearning system provides assessment, feedback and remediation throughout the course, so student divers will always know how they’re doing. • After completing all sections of the course, divers take the PADI Enriched Air Diver exam and get instant results. The PADI eLearning system scores the exam, provides remediation and – if needed -- administers a retest. • Once divers finish the online course, they simply print the eLearning Record and bring it to their local PADI Dive Center or Resort where they’ll complete a quick review and the practical applications of the course -- including dive planning, gas analysis, fill procedures, etc. -- as well as the optional, but recommended, open water dives. Scuba diving with enriched air nitrox delivers more no decompression dive time. This means more time underwater, especially on repetitive scuba dives. When diving using enriched air nitrox, divers can typically stay down longer and get back in to the water sooner. No wonder many divers choose this course as their very first specialty. To enroll in the new PADI Enriched Air Diver Course Online, divers should contact their local PADI Dive Center or Resort or start today by visiting padi.com/elearning.